Today we’re going to make kimchijjim, which is braised kimchi with pork and/or with mushrooms. It’s a delicious, savory side dish for rice that’s hearty, meaty, spicy & addictive! If you like kimchi, you’re going to love this dish, especially if you like kimchi-jjigae. 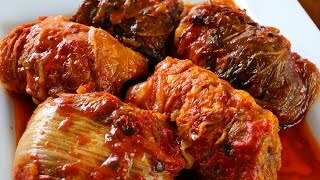 Even people who are not crazy about kimchi tend to like cooked kimchi, because it’s so tender but still a little crispy. I’ve posted many kimchi recipes on my website so far, but as you know, napa cabbage kimchi is the king of kimchi and it’s pretty versatile too. Most of you have been making kimchi for years, but I know that some of you newbies think that making 10 pounds of kimchi at a time is too much. 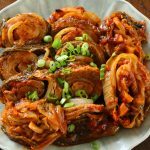 But my veteran readers will tell you that you can make a lot of things with it: soups, stews, pancakes, kimchijjim, even fusion dishes like kimchi hot dogs, or your own inventions, fusing kimchi with your traditional food. You need it all, and it runs out fast! It reminds me of my Chinese friend Yuyi, that I met when I lived in Missouri. She came to my house for lunch, and saw my huge containers of kimchi in the fridge. I still remember her eyes getting wider and wider by the second. I lost contact with Yuyi, I really miss her. She went back to China, and I went back to Korea, and we kept in touch for a while but lost touch. I learned some real authentic Chinese dishes from her, maybe someday I will post the recipes. Koreans call this dish a kind of rice thief, or bapdoduk (밥도둑), because it’s so delicious and goes so well with rice that your rice will be gone before you know it! A lot of people want to cut down on carbs these days, even in Korea, but traditionally we eat a lot of rice and dishes that are bapdoduk are some of my favorites. Kimchijjim is best served with multigrain rice for a well balanced meal. Or make it for a buffet or potluck party: it looks beautiful and everyone will love it. Everyone should get one or 2 rolls on their plate, and if you want to be nice to your guests you can ask them: “Shall I cut it for you?” and if they agree, you can cut it Korean style, with kitchen scissors. Or just provide a knife and fork and let them do it themselves. If you want to make a purely vegetarian version of this dish, you need to use kimchi made without fish sauce or seafood. Be creative: add your favorite stuff to make it delicious and savory. I hope you enjoy this recipe, and if you try it let me know how it turns out. Drain the mushrooms, chop them into small pieces, and put them into a mixing bowl. Add the ⅓ cup minced onion, soy sauce, 1 teaspoon honey, chopped green onion, 1 teaspoon sesame oil, and ¼ teaspoon of ground black pepper to the bowl and mix well. Set aside. Slice the large onion thinly and place it in the bottom of a heavy pot. Place 2 to 3 large and long leaves on the cutting board and add 1 strip of pork belly in the center lengthwise. Grab the kimchi and pork belly and roll them up tightly. Tuck the sides in and shape the roll tightly so that it won’t fall apart while cooking. Put the roll on the sliced onion in the pot. Repeat to make 4 more rolls with the rest of pork strips and kimchi. Put them into the pot. To make with mushroom-filled rolls, place 2 to 3 large and long leaves on the cutting board and add the half of mushroom mixture in the center. Roll it up tightly and put it in the pot. Repeat with the rest of mushroom mixture to make another roll. Put it into the pot. You will have total 7 rolls in there. Spread the hot pepper paste on the top of each roll evenly with a wooden spoon. Drizzle the rice syrup and 2 teaspoons sesame oil over top. Sprinkle with¼ teaspoon of ground black pepper. Add 1 cup water. Cover and cook for 10 minutes over medium high heat. Lower the heat to medium and cook for another 30 minutes. Open and ladle some broth from the bottom of the pot over top of the rolls so that the seasonings mix evenly. Cover and cook another 20 minutes. Total cooking time will be 1 hour. Serve hot with white fluffy rice or multigrain rice. You can give each diner their own roll, or cut them up into bite sized pieces for them. Posted on Friday, July 31st, 2015 at 7:51 pm. Posted June 24th, 2018 at 11:32 am | Log in to reply. I made this last night with some changes. First, I used ground pork instead of pork belly. Then I took the vegetarian filling and added it to the pork because why not! Plus I do this when I make shumai and I love to use dried mushrooms. I wrapped everything up nicely In the traditional kimchee I made a few months ago. Finally, the bottom of the pan I added korean yams to the onions. Pilled everything into my Dutch oven and bam a delicious one pot meal. I love all your recipies Maangchi. Thank you for teaching this Cuban lady how to make Korean food! I make it all the time! Posted February 15th, 2018 at 9:28 am | Log in to reply. Posted May 29th, 2017 at 5:23 pm | Log in to reply. This recipe is AMAZING! I followed it exactly, and it was absolutely delicious! May I suggest more tofu recipes, and more seafood recipes? You could start with a new seafood sundubu jjigae video! The best of both worlds! You are the best!!!!! Posted April 10th, 2017 at 11:43 pm | Log in to reply. Thanks for this great recipe! I cut down the time because it got a little burnt my first time, but the kimchi was really tough to chew and I ended up having to eat it separately from the meat. Do you think this is because of the brand of kimchi I bought, or because I cut down the cook time? Posted March 12th, 2017 at 6:35 am | Log in to reply. Didn’t need a full recipe. Just made two rolls to go in my earthenware bowl from the Korean market. Tossed some salted shrimp on top. Will let you know how it goes. First time trying this recipe. Posted March 12th, 2017 at 7:33 am | Log in to reply. That photo was before cooking. It came out fantastic! A bit earthy and salty from a bit of doenjang I added during cooking. Just delicious. Just plain Calrose rice was perfect. I will definitely make this for my family and friends. Posted October 25th, 2016 at 12:21 pm | Log in to reply. Posted August 18th, 2016 at 7:46 pm | Log in to reply. I’ve made this recipe a few times and decided to expirement. Took some kimchi and sliced it into pieces, then made a rose out of them. I used green onions to make leaves. Thank you so much Maangchi for this recipe! It’s ones of my absolute favorites!!!! Posted August 21st, 2016 at 11:13 am | Log in to reply. Yes, your kimchi rose idea is very creative! It looks very tasty! Posted June 27th, 2016 at 1:14 am | Log in to reply. This looks insanely delicious! I’m going to make it later this week with the kimchi I made over the weekend. Would pork back ribs work well with this recipe since there isn’t pork belly in the grocery stores near me? Also can I make this in a Dutch oven since I don’t have a shallow pan with a lid like you use? :) ive been wanting to make something like this for months, since I watched a K-drama called Late Night Restaurant. Always makes me hungry. Posted July 7th, 2016 at 8:51 am | Log in to reply. “Would pork back ribs work well with this recipe?” Yes, it will work well, too and dutch oven sounds great! Posted October 13th, 2015 at 11:25 am | Log in to reply. i m so hungry watching this video , it looks so delicious . Looks like i won’t be able to make this since my kimchi that i made was chopped kimchi , not the whole kimchi like in your video . But i think , this is similar to kimchi stew wouldn’t it ? with kimchi , onion , garlic , gochujang and pork belly ? yes ? no ? Posted October 16th, 2015 at 12:08 pm | Log in to reply. Yes, it tastes similar because the main ingredients are kimchi and pork belly! Posted August 12th, 2015 at 8:09 am | Log in to reply. 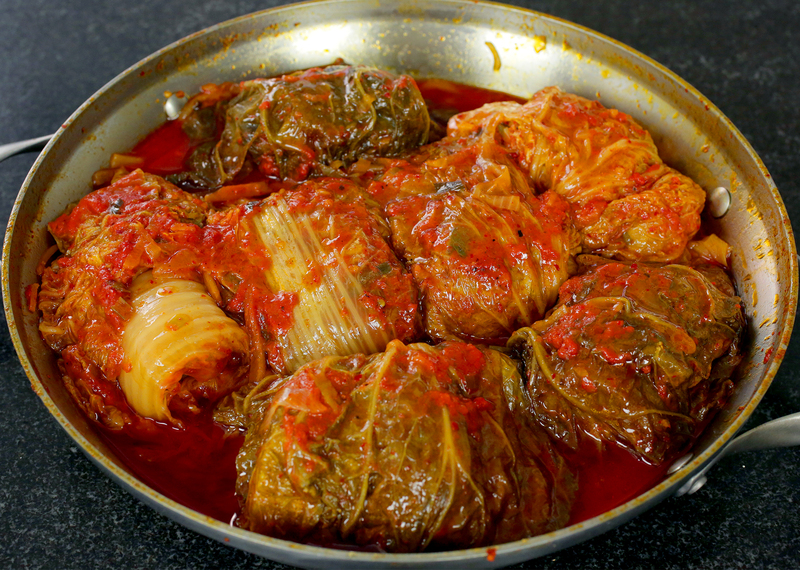 Korean Sarma! I love this dish so much, and now I have an excuse to try a Korean variant. Posted August 11th, 2015 at 10:20 pm | Log in to reply. Wow, Maangchi! 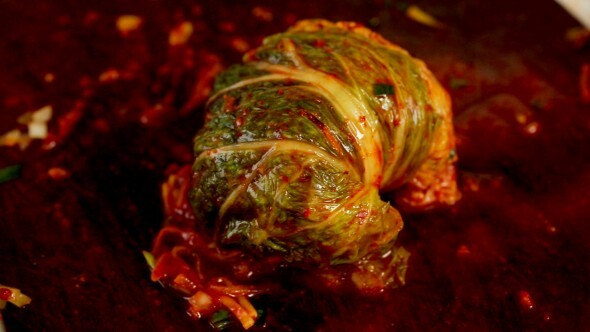 Talk about putting a new twist on the eastern European cabbage roll. Can’t wait to try these. And I love the skirt comment! Cute! Posted August 5th, 2015 at 5:41 am | Log in to reply. Posted August 5th, 2015 at 2:45 am | Log in to reply. 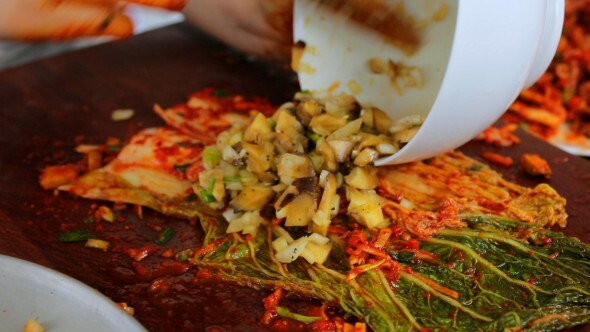 I want to try this, but first I want to try making my own kimchi! I hope I have time soon. I’m going on vacation in a few days and then I go back to school a few days after I get back so this might have to wait until winter holidays. Posted August 1st, 2015 at 4:35 am | Log in to reply. Wow, just looking at it already made my mouth water. I can’t wait to make this dish. I made a fresh batch of kimchi just 2 weeks ago. So just got to wait patiently. Thanks for the recipe Maangchi ssi. Posted July 31st, 2015 at 11:12 pm | Log in to reply. Thanks maangchi! I have 90 pounds of baechu kimchi in my fridge currently. Posted August 27th, 2015 at 6:27 am | Log in to reply. Haha, I had to read your message twice, we happen to have the same name! I am Spanish, but I have a Chinese name because I study Chinese and I lived in China for a while, so I adopted 馬傑 as my Chinese name :-D :-D Now, I’m happy because I also know my Korean name: 마걸. Posted August 29th, 2015 at 12:47 pm | Log in to reply. This recipe was originally posted on July 31, 2015 at 7:51 pm by Maangchi. The video was watched 597,392 times on YouTube & has 10,268 likes!